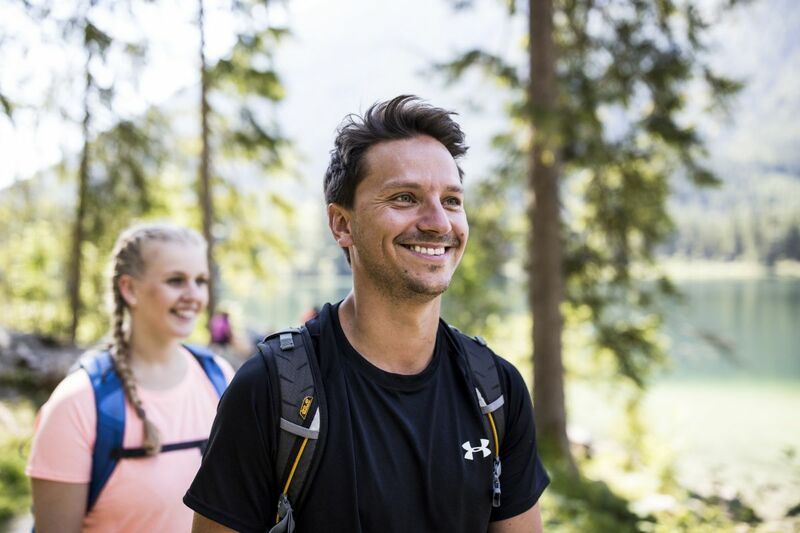 In Oberstdorf in the Alps of the Allgäu, the Explorer Hotel is your location for being active in the mountains. 400-peak view from the Nebelhorn, ski jump and Freibergsee, romantic and unspoilt valleys... those are only a few of the highlights in Oberstdorf. Welcome to Explorer Hotel Oberstdorf! Take your hiking boots and discover the mountains of the Allgäu. Relaxing in the Explorer Sport Spa after an active day in the mountains Explore the mountains - the Alps are waiting for you! 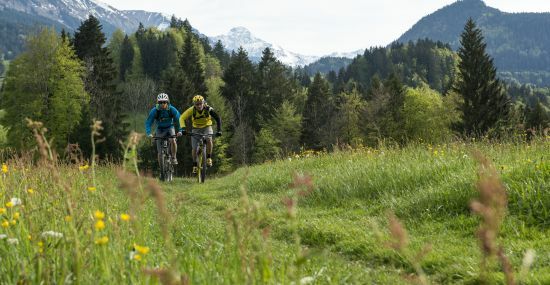 In and around Oberstdorf you will find your own personal adrenalin rush. Well-secured and accompanied by experienced and professionally trained guides you will be in good hands. Experience the element of air during the summer or winter and discover the untamed nature of the Allgäu at a tandem flight. So that your experience remains unforgettable, you and an experienced and licensed pilot will be flying "hands-free" through the breath-taking scenery of the Allgäu Alps. Or what about a kayak tour or rafting? The NTC Park at the See Alp station promises fun and action on the most diverse sporting devices. Whether you are on a tubing track, on the snow bike, using the ski fox or on the air board – you will experience pure wintertime enjoyment. Cruising down the hill on a wooden sledge – tobogganing is not just fun for the little ones. At Nebelhorn for example the trails runs 2.5 km hair-raising kilometres from the See Alp station all the way down to the edge of the town. You can also rent your sledge at the See Alp station. The Explorer Hotel is your ideal bike location: you have access to rental bikes, your own personal sports locker, and a true biking paradise right in front of your hotel room door. In addition you can also book a riding technique course given by a trained guide or you can simply ask for tips on the best tours. A mountain-biking heaven - come and see for yourself ;-). At all altitudes, the freedom of the 400-peak vista will be close enough to touch! 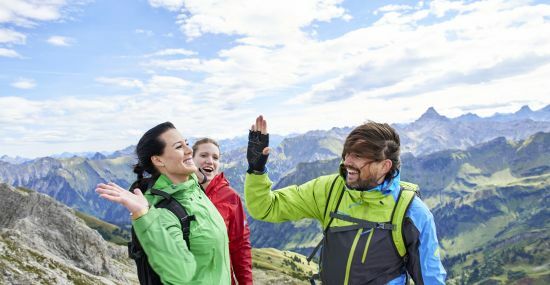 From easy-to-navigate trails up to challenging ascents and difficult trails, Nebelhorn has a trail and a hike to suit anyone’s abilities and tastes. Lush red flowering Alpine roses, streams and mountain lakes await you at Fellhorn / Kanzelwand. With its bizarre Karst formations and steep cliffs, Ifen is both imposing and challenging. As diverse as no other ski area in the Allgäu. We offer over 12 km long slopes at elevations up to 2,224 metres – safe and untarnished ski and snowboarding fun. The 7.5 km downhill run (which is Germany's longest) is considered a “must ski” by all skiing connoisseurs. Söllereck is the ideal hiking and skiing area for the entire family. In the winter there are 10 downhill runs and 12 km of professionally prepared slopes ranging from easy to challenging. For some different kind of fun and action there's the "Easy Funpark". Germany's largest cross-border and most modern skiing area, Fellhorn/Kanzelwand is a real adventure. It features 22 km of downhill slopes and beautiful hiking trails. The highlight is two fun parks that lead to daring jumps. The Walmendinger Horn in Kleinwalsertal is an insider tip – deep snow paradise for free riders, place of solitude or the place where the locals get together. Twelve kilometres of perfectly prepared slopes and numerous deep powder snow routes make Walmendinger Horn so special. Tickets can be purchased at the base station. The ski area near the 2,228 meter high Ifen is the second largest in the Kleinwalsertal. But even so, things still transpire peacefully here. About 25 kilometres of prepared slopes offer families with children and beginners a very diversified skiing terrain. Tickets are available at the base station. Families in particular enjoy coming to the Balderschwang and Grasgehren ski areas: numerous lifts are available at both Balderschwang and Grasgehren –a wide variety of winter sporting fun is ensured. Tickets can be purchased at the base station. The Stinesser family ski lifts in Fischen are the optimal beginner lifts and are therefore perfect for the entire family. Two T-bar lifts, a children's lift, a magic carpet lift and a 200-metre long toboggan run are enough to keep both young and old content. Tickets can be purchased at the base station. The typical winter sporting area of Bolsterlang offers skiers, snowboard enthusiasts and trekkers a veritable plethora of possibilities. The fun park guarantees action and the 17-km-long runs encompass all levels of difficulty. Tickets can be purchased at the base station. The world cup ski area in Ofterschwang/Gunzesried offers 18-km long runs covering all degrees of difficulty – the highest degree of winter sports pleasure. Aside from snow-packed slopes the area offers winter hiking paths and a toboggan run. Tickets may be purchased at the base station. The wintertime activities are limitless! 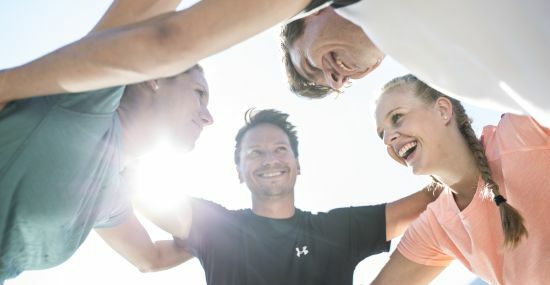 There are 75 km of cross-country tracks (55 km skating); enough tracks for you to take the term “cross-country” literally. Whether on tracks at higher elevations or on the challenging trails sued during the 2005 Nordic Skiing Championship – in Oberstdorf you will find a veritable cross-country paradise. TIME FOR MOUNTAINS. TIME FOR #EXPLORERMOMENTS. We will not forward your e-mail address. We hate spam just as much as you do. We promise! Each one of our newsletters contains a cancellation link. Whatsapp contact Click here to receive our vCard. Now our contact data will be imported directly into your WhatsApp address book.